The Captain returns from a family sabbatical to MU with Kelly Thompson at the wheel. After Margaret Stohl expanded the origins of our favorite cosmic Captain in Life of Captain Marvel, Kelly Thompson, arguably the best writer at Marvel, has taken the reins. Captain Marvel, aka Carol Danvers, recently discovered her mom hailed from the Kree Empire, not Earth, meaning Carol carries Kree blood in her veins. She discovers this as a result of a Kree assassin who murders her mother. Now Carol returns to New York City to fight the good fight. She reapplies for Avengers membership and reaches out to old friends. 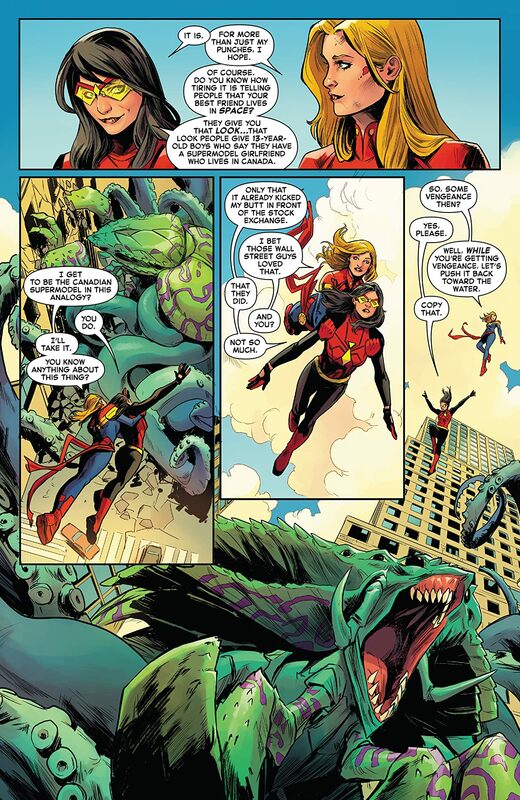 The issue starts with Carol fighting a giant six eyed stink bug/octopus monster alongside her best friend, Jessica Drew, aka Spider-Woman. After she does the hard work, Tony Stark shows up to collect the alien. He asks her for a meeting. While he is thrilled to have her return, he asks for two favors: 1)For Carol to do an interview and 2) for her to take Avengers Academy alum Hazmat under her wing. While meeting Hazmat, Carol runs into her ex-late ex-boyfriend James Rhodes, the man once known as War Machine before getting killed by Thanos on Carol’s Defenders team. 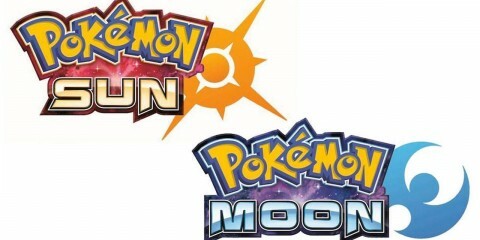 Then the story arc begins. This story manages to cram a lot of story into one issue. Kelly Thompson teaches a master class on a debut issue here. She catches the reader up completely in the life of Carol, she sets up the arc, and most importantly, she writes hilarious, lovable characters. The wit shines through the story, and I laughed repeatedly. I missed Rhodes and Hazmat, so seeing them return was worth the cover price alone. The issue ends with teasing the return of another under-used character, Echo, a deaf martial arts hero who went by Ronin in Bendis’s New Avengers run. The art here is gorgeous. I truly believe Marvel has better art than DC, and books like this serve as evidence. Not a page from Carnero is flawed, and Bonvillain colors a vibrant world. As a result, the two together make a heavenly match. Verdict: Buy! 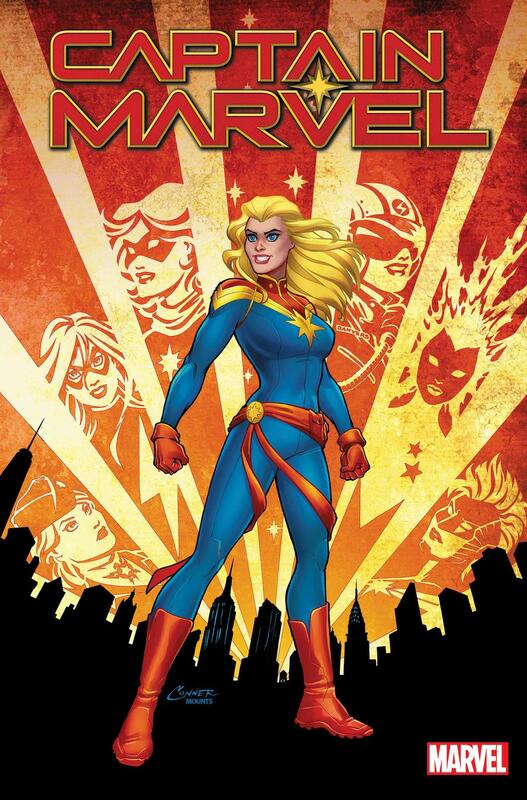 Marvel made the right move with the relaunch of Captain Marvel so close to the movie, and anyone curious enough to check out the hero will be handsomely rewarded. This book soars higher, further, faster, more.